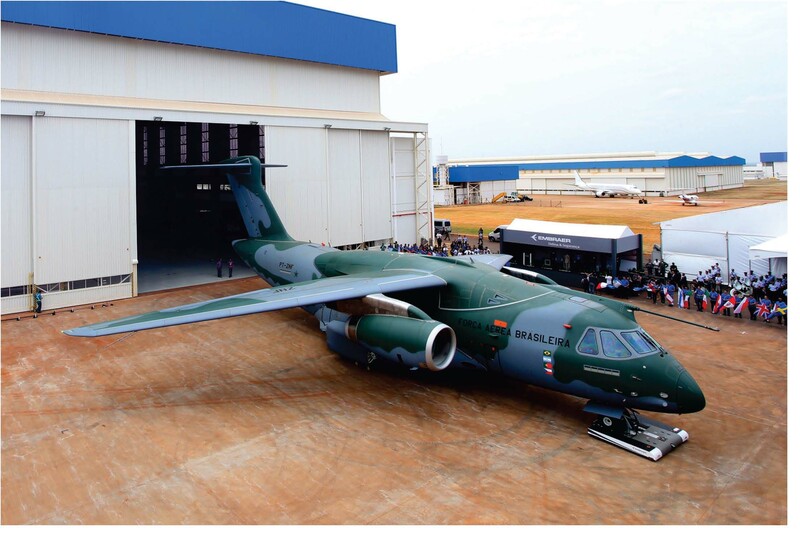 On October 21st 2014, Embraer rolled-out the first prototype of the KC-390 military transporter from the production hangar at the industrial plant of Gavião Peixoto, Brazil. The event was attended by the Brazilian Minister of Defense, Celso Amorim, the Commander of the Brazilian Air Force, Lieutenant-Brigadier General Juniti Saito, and delegations and representatives from more than 30 countries. This milestone roll-out will allow Embraer to perform important ground tests prior to the aircraft's first flight, planned to take place by the end of this year. "This significant milestone of the KC-390 Programme demonstrates Embraer´s ability to manage such a complex and high-technology project and to perform it on track," said Jackson Schneider, President and CEO, Embraer Defense & Security. "It paves the way for the beginning of the ground tests to prepare for the first flight." "The KC-390 will be the backbone of the FAB's air transportation network. It will be able to operate in both the Amazon and Antarctica. The jet engines give the aircraft enormous agility in fulfilling all of its missions, faster and better," stated Aeronautics Commander, Lieutenant-Brigadier General Juniti Saito. Following the roll-out, the aircraft will continue with initial systems evaluations leading to the first engine run, and then to the ground vibration tests and the other planned ground tests. This aircraft is the first of two prototypes that will be used in the development, ground, flight and certification test campaigns.